Deem Work Fource is a suite of cloud and mobile software applications that saves your employees time booking and managing their travel, saves you money on air, hotel and ground - and helps you both get more done in less time, with more choice. 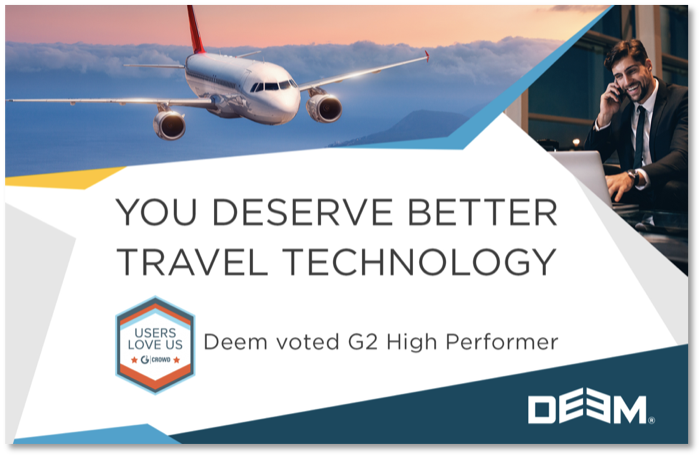 Trust us, you and your travelers will love using Deem’s G2 Crowd favorite software. Deem’s technology plugs into your travel management company and expense provider of choice. Powerful APIs mean you and your travelers will be up and running in no time, and your travel agency can service your travelers effortlessly. In fact Deem is so easy to use, your travelers can service themselves! If you switch your online booking tool to Deem your travelers and travel management team can use Deem Work Fource free for the first year, with a four year contract. Contact our sales team to find out more. There’s no reason to suffer with a bad booking tools that’s slow and difficult to use. you don’t need to settle for poor customer support or inferior content. Deem gives your travelers the freedom to book global flights, hotels and ground they want, but within a finance approved framework so you can manage costs and keep track of everything you need to. A day of golf, spa or wine tasting + thought leadership content workshops at no charge to you. If you commit by the deadline, you’ll secure your spot at Deem’s Upgrade Leadership Session in Napa Valley, September 2019. As Deem’s special guest you join the travel industry’s elite travel managers to participate in a weekend full of industry insights and leisure fun.